Passwords are case sensitive and must be entered correctly. If you do not remember your password, click the 'Forgot your password?' link. This will prompt you to enter your email address, this should be the one associated with this account. Once you have entered your email address, click the 'SUBMIT' button. An email will be sent to your registered email address. This email contains a link to reset your password and a verification code. Note that passwords within eLetRef are stored in a highly encrypted format and cannot be read back into your chosen password. Therefore if you forget your password you will be sent a link whereby you can reset it. Click on the link and enter your username (this is your email address if you are an Applicant). 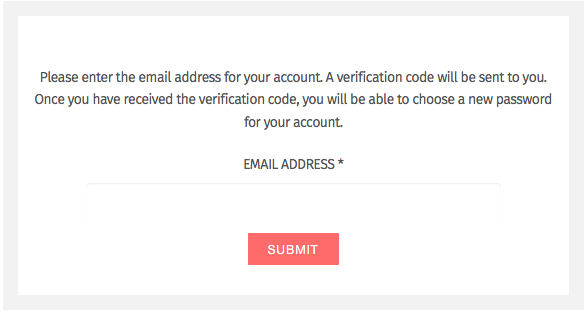 Then enter the Verification code which is contained in the email. Note the verification code is case sensitive so it is far easier to copy and paste it into your browser than to try and retype it. Once entered correctly you can reset your password, we recommend that you choose something which will be secure containing both letters and numbers and a mix of upper and lowercase letters. Avoid dictionary words or anything which might be easily guessed. Do not use a password which you have used on other sites.